I was looking at the rampage soft top, if anyone has them any input would be helpful. Do the side and rear window roll up and secure to the top or zipper all the way out? If they do roll up, are they secure enough to drive highway speeds rolled up? Jeff's Bronco Graveyard Full Top Fasttrac Zipper Review & pic in a 94; Jeff's design is a copy of the old STC (Specialty Top Company; out of business now); "...Well, the soft top is on. It took about 2.5 hours and it looks pretty good on the Bronco at a distance. I've got to say....I'm not that impressed with it. For almost $650.00, its really cheaply made. Its made in China. Its single stiched and alot of the snaps don't line up with the snaps on the frame. The frame bows are thin walled pipe and the lengths are off by about 1-2 inches. The kit was missing a package of sheetmetal screws. As for the new and improved tailgate frame, you are supposed to take it on and off each time you exit/enter according to the instructions. I would mount the frame to the tailgate with sheetmetal screws.....but the fabric rear window is about 4" to long. There's not enough adjustment in the frame bows to adjust it. All in all, I'm disappointed with it. Someone else might like the top.....but if I had to do it over again I would just keep taking my hard top on and off..." miesk5 NOTE; Jeffcityguy wrote; Just off the Phone with Rampage, they make the top for JBG. They did say this was their own design, not a copy. No pictures that he could email, said go look at JBG's site. Jeff's Bronco Graveyard Full Top Fasttrac Zipper Review & pic in a 96; "...I got a Soft top From BJY And well I am 100% happy with it. There are a few fit ment issues that i think will work out as the top loosens up. Now i have the same issues that every one has with this top, Gaps along the rails and what not, But Sice i live in FL and dont plan on useing the hard top any more, I just used some silicone caulking and sealed it with that. I just need to get some eather stripping for the rear rail, Due to two gaps right at the ends of the rear rails. well enough talking heres the bronco. They aslo had clear windows but with my front windows i think if i had clear soft top windows it wouldnt have looked right. 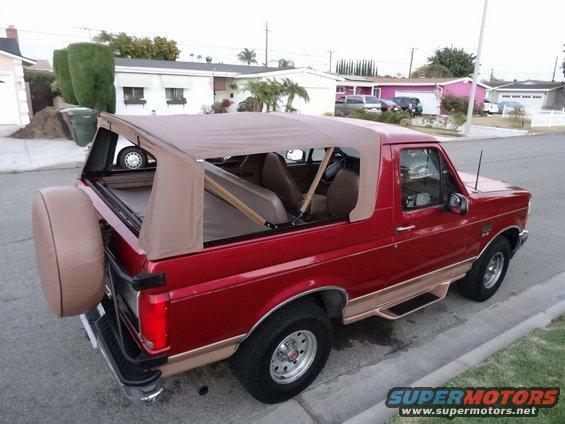 It took about 2.5 hours to install..."
Jeff's Bronco Graveyard Full Top Fasttrac Zipper Review & pics in an 88; Jeff's design is a copy of the old STC (Specialty Top Company; out of business now); "...I installed my new soft top from Jeffs today. All in all it went okay. A few Snags. 1. Aluminum extruded Metal was about 3/4" too long on cab. 2. They shorted me 4 sheet metal screws 3, Screws were really weak. Broke a few. 4. Fit and Finish is Good but could be better. But I still love it. I think it looks great!..." Jeff's Bronco Graveyard Full Top Fasttrac Zipper Review in an 89; "...My came from JBG, packaged as a Rampage top. The fit very well, but like some have found, the weatherstripping may not be thick enough where the top sits on the bed rails..."
I had to post between Tablet freezes. I do not believe Rampage sells Bronco tops directly. Black Diamond textured 20 ounce marine grade vinyl. This new material is a lot thicker and higher quality that what has previously been available. These tops require much less drilling to install than the older snap type tops. The belt rail, which mounts to the top of the body, uses existing holes for the mounting bolts. The cab channel requires drilling to mount, but there is no drilling into the tailgate at all. There are two holes which have to be drilled into the top of the bed sides at the rear, and also, you have to drill two holes on each side for the bow mounts. Seat belts will not work with 1992-96 vehicles. thank you, the only tops I have found are the rampage which us sold at bronco graveyard. There is also one on softoppers website. I purchased lap belt and installed them for the back seat so I can take the top off (after breaking 3 T50 impact bits, drilled the bolts out). I was looking for discount codes with the graveyard, but looks like I can get the same rampage top pretty cheap at Autozone using coupons and a gift card I have. Jeff at the Bronco Graveyard has offered a 2% discount to members of The BroncoZone for on line orders. To get your discount, enter the discount code BZMEMBER. Also you must include your BroncoZone User Name with the order. 3rd Brake (High Mount) Light Installation; Mounted on Spare for Soft Top, etc. in a 92; "...Find the plug under the driver side panel and "tap" into the red/green wire (make sure this is the correct wire by pressing the brake light with a tester attached.) Put wire under the carpet or the black trim at the base of the carpet to keep hidden. Than ground the black wire behind your back panel. I have an amp so i used my amp ground..."
"Since I reside in the "Peoples Republic of California" I also had to fab up the third brake light. I used an off the shelf 4 LED light ($10), a piece of lexan (I shaped to the light size) and a "L" bracket. I used the mounting screw as the ground point and an 18 AWG direct burial wire (overkill but all I had) to complete the circuit. I ran the wire into the paneling on the driver's side and tapped into the solid green wire at the rail to top connection. Ok, looking fwd to pics and your opinions. Any installation work-arounds you did to the top? So....I am needing some help. I recently had someone give me one of these, however I am missing the Rear Bow Mount and the Bow Release Bracket. Can any one please give me some measurements so I can get some fabricated. *I called Rampage first they do not sell hardware or these two parts separately. My tablet or Comcast won't allow pics to appear so look through it.